This entry was posted in New from Marcus Fabrics, Quilting Projects and tagged #marcusfabrics Marcus Fabrics, #mostlymanor #victoriafindlaywolfe, #pambuda, @pambuda @heartspunquilts #heartspunquilts, applique quilt, English paper piecing, gradmother's flower garden, hexagon, hexie quilt, Lucy Boston quilt blocks, paper piecing by Lisa Shepard Stewart. Bookmark the permalink. My hexie fever has gone Full Tilt Boogie. I began cutting my own papers and creating a queen sized Grandmother’s Flower Garden. Now, I’m working on The New Hexagon QAL, The Glorious Hexagon QAL and Jen Kingwell’s Smitten Quilt. I love the hand work and fussy cutting to feature motifs in my quilts. I am excited about the increased interest in English Paper Piecing and hexies because fabrics like Vintage Onyx (love the black and tan combo) give SO many options for creating great secondary patterns in our quilts. I can’t wait to see what the future brings in the field of EPP. PS Love your reproduction and vintage styled fabrics. I have two hexie projects going right now. One is a Grandmother’s Flower Garden with 1″ hexies and 30’s repro fabrics that hopefully will be a fun quilt some day. The other is a fall table topper with 2″ hexies that I started while traveling to Japan this past March. I am working on the small Mrs Holder’s hexi Quilt as part of a sew along on the Temecula Quilts blog. I’m using 1/2 inch hexis. It’s a great carry along project for summer! I’m making a queen size right now…about a year into it…1″ hexies. Rainbow colors and black, it’s evolving as I design as I go! About 1600 more pieces to go………. 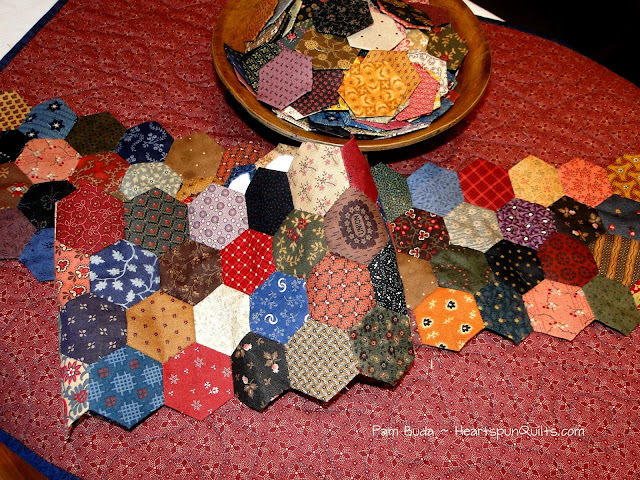 I am embarrassed to say that I have not made any thing hexi yet – but a hexi project is definitely on my bucket list. Thanks! I love making hexie quilts and and hexie placemats in the shape of a flower. My favorite size hexie to made is 4″. I have made a couple of potholders with 1 inch hexie ‘flowers’ appliqued on them, and now I am working on the Brinton Hall quilt, whose entire center is medallions surrounded by many, many hexagons. Argh! What am I not doing with hexies is my question? More is more. I taught a fairly young lady (55) in a nursing home to do hexies. I taught her to do English Paper piecing. One of the ladies in our quilt club taught her to hand quilt. She even managed to sell some of her quilts. I adore all things hexie and EPP! Also, Victoria is so incredibly talented! I love hexies but I haven’t made anything with them, yet. This would be a great time to try them. I would love to make a large quilt like my mother and grandmother made me when I got married 56 years ago, but there are several fabrics that need replacing so that’s my first project. I am almost finished 29th my Lucy Boston patchwork of the crosses quilt! And I love to do projects using teeny- tiny hexies. I love hexies and I have a box with hexies and would love to make a large quilt with them and my favorite size is 2 or 2´5 inch. I plan on making a Passacaglia quilt eventually, but have not tried hexies yet. I’ve had hexie fever for many years. Just when I thought I was over it, the whole world has gone hexie crazy! So I’m back in the spirit, loving it. I’m working on the block from The Splendid Sampler which is a hexagon applique wreath, fun, but a little on the small side. Would like to try something a little larger. I’m making hexies to turn into make-up bags and sewing kits! I wanted to join in the Hexie fun but did not want to pre-turn, baste or whip-stitch. So I created #StitchFast, self stick templates that can be used until they not longer stick, 5-15 times. They can be used to fuzzy cut shapes from the right side of the fabric, then use on the wrong side of the fabric shape to straight stitch corner to corner of the template, tacking at the beginning and end. That simple. Add shapes to all sides of the template then move it and begin again. So love all sizes of hexs. Lots of other shapes available. I am working on finishing a pillow project I started years ago with hand pieced hexies. That is one eye opening hexie quilt by Victoria. I have worked with hexies but it’s been awhile. Mostly when I am doing handwork, I am crocheting. Thanks. I, too have a couple of hexie projects but my current favorite is a scrappy blue batik Star Flower quilt. Slow. I do EPP all the time and am currently working on a batik project with flowers made from hexies, triangles and diamonds. I am leaving on a jet plane tomorrow and am starting my hexie addiction. I’ve made several hexie quilts, table-runners, and even a bag! Trying a pieced hexie project next! Love hexies and I am currently working on a bag pattern that has hexies on it. Love those hexies, especially the tiny ones. I am oh-so-slowly making a modern-feeling Grandmother’s Garden quilt, using modern florals. It has been fun, choosing the fabrics, having something to carry with me, thinking about its progress and eventual completion. I’m not currently working on any hexies, but I need to. I have a bunch of vintage hexie flowers that need to be finished. I bought a hexie template a couple years ago, the largest size is 5″. I cut enough from all my favorite beachy fabrics to make a single Grandma Flower Garden flower that measures 60″ diameter. I hand pieced it, sandwiched it with flannel for a summer lap quilt, and am now hand quilting it with Superior embroidery thread using a Sashiko needle and the quick stitch technique. When I’m finished with that, I will go back and do hand embroidery in random blocks to highlight some of the printed motifs. It is a VERY long term project, but it has been fun to work on it and am still enjoying it. I hand quilt and embroidery frequently, but this will be the first quilt I have made that is completely hand done. I am using one inch hexies to create a pillow top. Can’t wait to learn this new pattern (to me) first time. Thanks. Love V’s. work. I have the fever-but now want to make the giant hexies like Victoria! I have been hand piecing on a queen sized Grandmother’s Flower Garden for a long time and have made several smaller projects all with English Paper Piecing. I love her fabrics! I am currently working with 4 inch hexies. The end product may become a shower curtain for a guest bath. I also enjoy making 1 inch hexies. I made a sunflower quilt with 1 inch hexies years ago. Now my son and his family enjoy snuggling under it while reading or watching TV. I havent made anything with hexies, but I would like to! I’m not currently making anything with hexies, but a recent finish was a twin quilt with half-hexies. I have a couple hexi projects going. One I hope will be a quilt but right now epp the pieces to form a center piece that I then want to applique onto a sort of diamond background and maybe bring in more hexis to finish. The other project is to just make small epp hexis from some of my moms old fabric that I saved.